First a Personal Note: Jamie (who heads up our order processing) had a little motorcycle accident last Sunday and ended up with a broken wrist and ankle. Motorcycle + Deer Crossing the Road = Ouch. First, Bandai FINALLY announced the release of Code Geass and best of all, they have moved it up to August (it had originally been planned for September). We now have it up for pre-order here. I would like to note that they are going to release it the same way they are doing Toward the Terra, with 2 single volumes, or a less expensive 2 disk pack that will contain the same two DVD's for a lower price. This seems to be Bandai's new method of 'channel stuffing' and we see no need to carry the two single DVD's when the 'pack' is the better value. Just a heads up as to why we don't have those single DVD's listed in case you see them offered at other places. Second, we have received Gurren Lagann & Lucky Star 2 way early, and they are already shipping, so no need to wait for those other slow retailers to ship it in July. I do want to note that Bandai is running a big Gurren campaign at Anime Expo, and is holding some copies back for the show, so they have only shipped us the first 1/3 of our order of the single DVD. More are coming, but demand has been VERY high and we'll probably run out of the single shortly before more get here. We have ALL our copies of the Limited edition, so if you want to make sure you get immediate delivery you should opt for that LE version. All of your pre-orders for both versions have already been filled and should be on your doorstep soon! :-) Outstanding! Heads up, one of our inside contacts at ADV informed me this week that they have experienced some 'reproduction problems' with the upcoming volumes of both Shattered Angels #2 DVD and Kanon #6 DVD so Shattered Angels will probably miss the June 24th street date and ship late, and Kanon 6 will also either be shipping very very close to or shortly after the official July 1st street date. Coming as no surprise to anyone, PiQ magazine went belly up this week and announced that the July issue will be the last one. A post, from "the editorial/creative/production staff" blamed "low advertising revenue, poor business management, and a lack of proper marketing and promotion" for the cancellation. They also said that its best efforts went for naught, because "without a good financial backing, it's all an exercise in futility." My take is that ADV cannot financially support any startup or money losing division right now, and had no choice but to kill it. We had been a long supporter of NewType USA, but we declined to advertise in PiQ after they choose to pursue a new format. I remember Emily Olman (who quietly quit the magazine last month) calling me and outlining their plan to double their circulation by years end. After I got an advanced copy of the first issue, I knew that was a pipe dream. I hope all the paid subscribers, especially any of you NewType holdovers, are able to finally get subscription refunds from those folks. Funimation announced that they have licensed the sports Anime Big Windup (Ookiku Furikabutte) but they did not indicate when it might be released. ICv2 reports that in spite of its prestigious awards no American publisher has yet acquired the Ookiku Furikabutte manga. Manga-ka Asa Higuchi first learned about baseball from the Dokaben manga, but she spent 10 years researching high school baseball and she brings a shojoesque interest in character development to the typically shonen sports manga genre. 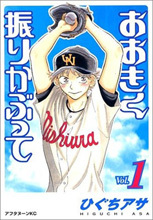 Ren Mihashi, the hero of Ookiku Furikabutte, is totally lacking in self-confidence because he believes that family connections got him the prize role of pitcher on his middle school baseball team. When he gets to high school he is reluctant to try out for the team, but eventually he blossoms as a player thanks to the help of his teammates, especially his catcher Takaya Abe. I think this will be a good decision on Fun's part, because the show was very popular with female viewers in Japan, and should reach out to a similar audience in the US. I hate to keep harping about what TokyoPop is doing, but this week they announced that they have hired a big Brand Management firm to handle their licenses for spin off merchandise associated with their master brands (you know, like Princess Ai). Ugggg. That's a bad sign when companies do that. Brand management is ALWAYS something that needs to be handled internally, but it's cheaper to outsource it, and again proves that the executive management at TokyoPop has no idea what they are doing. There is also word through a different source that Love Mode 11 and the next volume of Gakuen Heaven (part of TokyoPop's BLU line) are going to get postponed. It's pretty clear to us that TP will be implementing their planned manga output reduction by looking at each title strictly in terms of profitability, keeping the top sellers and quietly discontinuing a large percentage of their series that only see marginal demand. For our part, we'll be delaying posting many TokyoPop titles for pre-order until their fall schedule firms up. You know, we've been in the business for a long time, going on 12 years, and I have made a lot of jokes around the office that Anime and Manga producers used to be able to make plenty of money on 10% of the output they currently have, and now are struggling to make ends meet with 10x the amount of annual sales they used to have. It seems to me that during the middle of the decade most of the US companies gained wide eyes and forgot how to structure their businesses to serve a niche market, desperately wanting to move Anime into the 'mainstream' and grow rich off of mass market sales. Now companies like Geneon are gone and TokyoPop and ADV are having to eat a slice of humble pie, but the ones to suffer the most are the fans who have to take the blow of many great Anime series not getting produced or finished here in the US. Now many Manga readers are going to have to deal with the disappointment that some of their favorite series may not be completed. I myself am greatly disappointed that titles like Gundam Ecole, Suppli, and Trinity Blood are on the above list as I've been reading them since they were started. But despite all this turmoil, we here at RACS have built our lives and future around the US Anime community, and we'll stay with you guys through thick and thin no matter what happens in the short run. We've seen hard times before, and we'll get through these challenges now - right beside you. For you figure lovers (like me) Yamato USA said this week that it has come up with a process to make resin-quality figures out of PVC and is planning to prove it with a series of statues based on paintings by top fantasy artists including Luis Royo, Boris Vallejo, Dorian Clevenger, and Julie Bell. Yamato says their PVC research has yielded ways to minimize shrinkage (without Viagra), deformation, and parting lines. Yamato will use its new manufacturing processes along with revolutionary new painting techniques to produce what the company calls "resin-quality PVC figures." The new figures, which will debut in the US around December, will provide resin quality figures for an MSRP of $98, less than a third of what a comparable resin figure would cost.They sent us over some concept art to review, and it looks pretty exciting, so I'm anxious to see the first figure created from this new process! In addition to Gurren Lagann & Lucky Star 2 on DVD this week, we also have the next installment of Kujibiki Unbalance and the first Emma DVD Collection in stock. Check the store updates page for the complete list. On the manga side we have lots of new volumes again this week for your reading pleasure. Some of the notable new arrivals include Dance in the Vampire Bund, Welcome to the NHK, Kekkaishi, and the next volume of MY favorite Inubaka Crazy for Dogs. Check here for the whole list. We have a couple of new figures for you this week including the delectable Ryomou Standing Figure (get her while they last, because it won't be long), and the newest Eva 1.0 figure of Misato Katsuragi who went straight into my personal collection. The big news though is that one of our importers e-mailed us a final packing list this week for a HUGE shipment of 26 new figures, which are being loaded onto a tractor trailer right now in California and will arrive here all at once late next week. Here's the quick inside scoop on what's coming. Prepare yourself for the mother of all figure updates - coming soon! 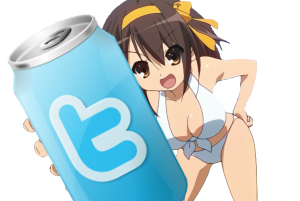 That's it for this week :-) Have a great weekend everyone, and enjoy your Anime!